Perhaps it’s because most of the calamities predicted in the first movie didn’t happen, hurricanes didn’t increase in frequency and strength, polar ice caps didn’t melt, NY and other coastal cities aren’t underwater, Mt. Kilimanjaro still is snow-capped, tornadoes aren’t increasing in frequency and strength, the arctic isn’t melting, the Antarctic ice extent is growing, oh and the polar bear population is doing very well thank you. 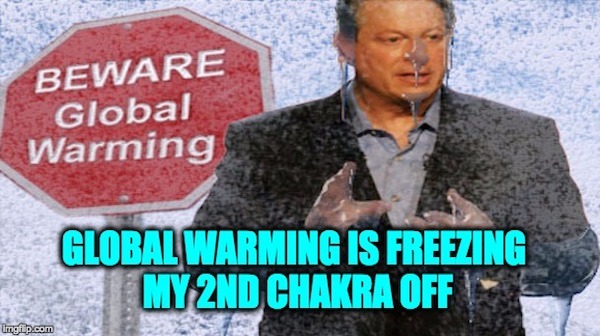 So former VP Al Gore wants to try another movie. He didn’t however take my suggestion and call the movie, “More Crap That Wont Happen.” The inventor of the internet did come up with something new and creative, he blamed Brexit on Climate Change, so it gets added to the “Stupid things blamed on climate change” list. There’s only one problem with Gore’s claim…it’s bogus. Satellite data proves that the earth hasn’t warmed in 18 years, which means when the Syrian civil war began the earth hadn’t warmed for 11 years. Therefore there was no global warming around for over a decade to cause the war. As far as the Syrian civil war goes, it 2011 Arab Spring which included major uprisings in Syria, Libya, Yemen, Egypt and Bahrain, and smaller demonstrations in Algeria, Iraq, Jordan, Kuwait, Morocco and Oman. But the “drought” Obama spoke of was in Syria. The war is now being fought among several factions: the Syrian Government, a loose alliance of Syrian Arab rebel groups, the Syrian Democratic Forces, Salafi jihadist groups, including al-Nusra Front and of course ISIS which started in Iraq thanks to Obama’s negligence in pulling US troops out too early, and not Syria, but in Iraq. A. There is no evidence that Climate Change causes drought, nor is there any evidence that the number/scope of droughts are increasing. C. The Syrian civil war grew out of the Arab spring, not a drought.